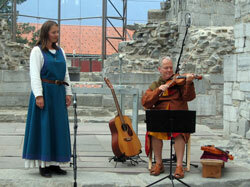 I just returned from a business trip to Hamar, Norway. While there we got to visit the remains of the Cathedral that was destroyed during the reformation. I recorded the whole presentation which includes the telling of the story of the Cathedral and some folk music. It’s over a half hour long but fascinating.